I must confess I really miss good Tex-Mex cuisine. Living in Texas for 11 years definitely spoiled me. And as much as I love New Orleans, it’s not a hot spot for Tex-Mex. So I have to do it myself. 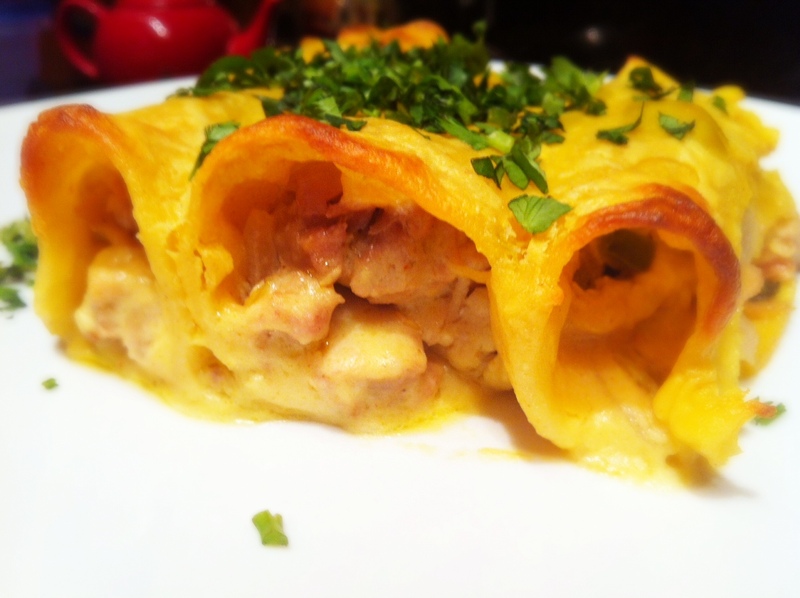 Last week I had a very specific craving for Sour Cream Chicken Enchiladas so I made some. Here’s my recipe. Preheat oven to 350F and grease a 9×13 casserole dish. Heat 2 TBSP vegetable oil in a small skillet over medium-high heat. Fry tortillas for 10 seconds on each side. Then place them on a paper towel-lined plate to drain. In a separate skillet, heat 1 TBSP vegetable oil over medium heat. Saute onion and jalapeño for 1 minute. Add chicken, 1 can of the green chillies and 1 TBSP paprika. Stir together. Add heavy cream and 1/2 cup chicken broth and stir. Allow mixture to bubble and get hot then turn off heat and set aside. In a separate large skillet, melt butter over medium heat and add in flour. Whisk together and cook for a minute or two. Pour in remaining chicken broth, whisk together and cook for an additional one to two minutes. Stir in remaining can of green chillies, reduce heat to low and add sour cream. Add 1 1/2 cups shredded cheese and stir to melt. Add 1 TBSP paprika and salt and pepper to taste. To assemble, spoon chicken mixture on to tortillas, individually. Top with cheese then roll. 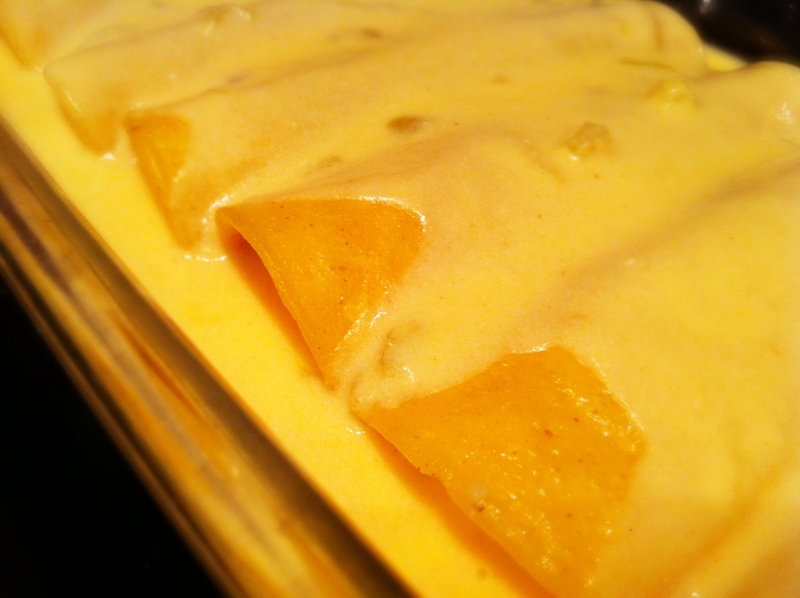 Place rolled enchiladas seam side down in 9 x 13 casserole dish. Pour cheese mixture on top of prepared enchiladas. Top with any remaining cheese you have. Bake for 30 minutes. Then let cool slightly, top with chopped cilantro and serve. Feel free to add in more green chillies or jalapeño if you want a spicier version. These can be made ahead and reheated before serving. I served mine with refried black beans, half a sliced avocado and of course a fresh margarita. These definitely conquered my craving, but I wish more New Orleans Tex-Mex options were available. Until then, I’ll have to make my own Tex-Mex. While I won’t go as far as to say chicken tacos are boring, they just need a little extra pizazz. So I decided to mix it up by creating some vertical tacos or what I call Chicken Taco Towers. The key to successful Chicken Taco Towers is a biscuit cutter or a round cuter of some sort. Not only will it be necessary to cut the tortillas uniformly, but it will help you stack things. 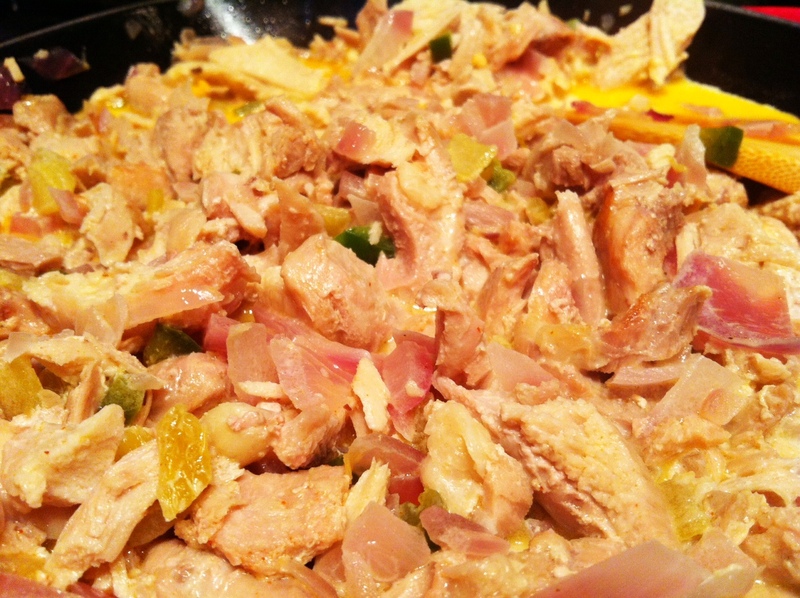 In a medium skillet over medium-high heat, heat oil and sauté chicken pieces, lime juice, chili powder, onion, salt and pepper. Continue cooking until all chicken pieces are cooked and/or register 185F on a meat thermometer. Once chicken is cooked and tortilla circles are ready, you can begin assembling the Chicken Taco Towers. 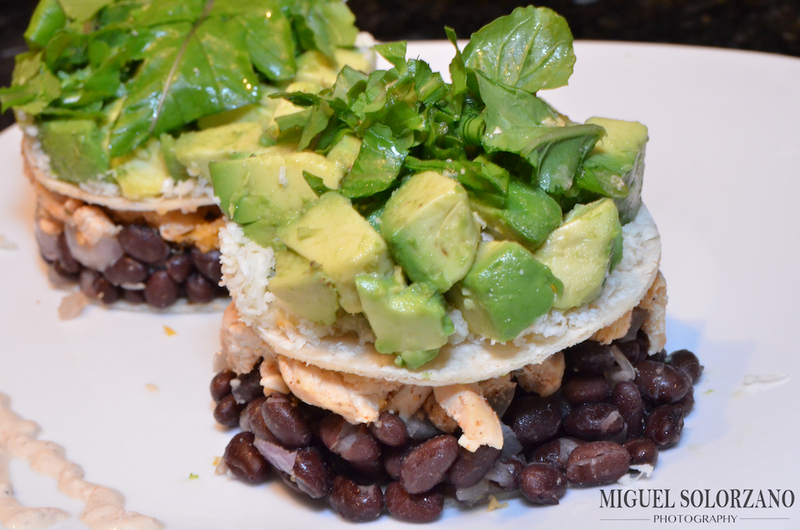 Using the biscuit cutter and starting with a tortilla circle, layer beans, chicken, cheese, avocado, lettuce and tomato. Be sure to move the biscuit cutter up as you stack and press down the layers firmly before adding another one. I experimented and found the beans best on the bottom. Also, I highly recommend adding chicken with cheese for a melty effect. And, I would save the lettuce for last so it doesn’t get too compressed. 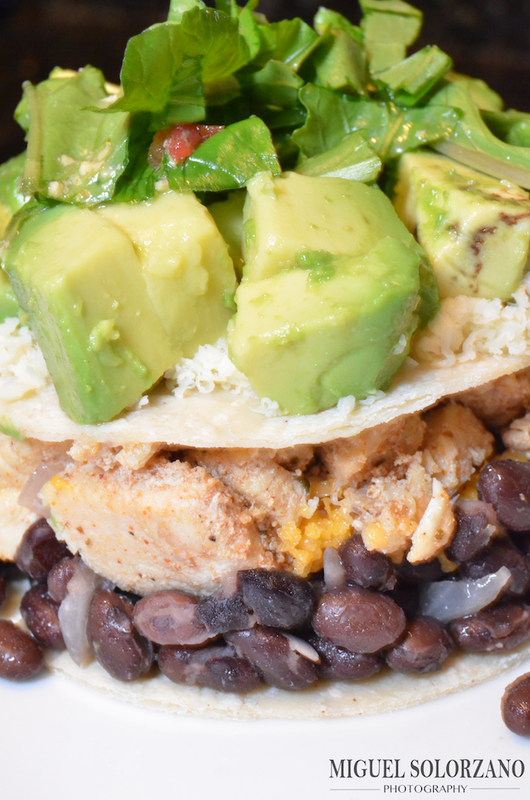 If this assembly is too fancy for you, there’s nothing wrong with making traditional chicken soft tacos. The flavor will be virtually the same. Honestly, I was testing out using my biscuit cutter for layering so I was exploring. Chicken Taco Towers are just a new look for the tacos we’ve all come to love. And let’s face, some tacos can look pretty sloppy so at least give this method a try.